Delta’s robust and distinguished package pumps are capable of diverse applications where quality matters. Using advanced pump design techniques our packaged systems are designed and manufactured here in the United Kingdom. The Dual V4 packaged pump station has been specifically designed to work in unity with the Delta Cavity Drainage System to collect ground water via a perimeter channel or 110mm pipe (129 Detail). 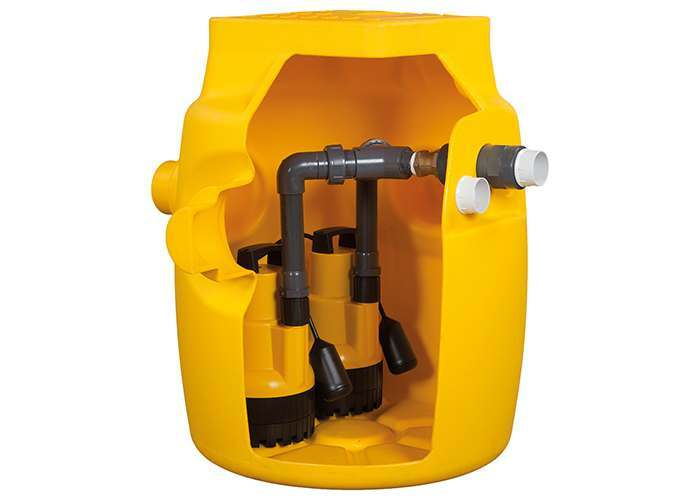 The Dual V4 offers a higher discharge head to the V3 range and is suitable for double and triple depth basements. Manufactured from High Density Polyethylene (HDPE) this package pump station has been designed to withstand the strongest hydrostatic stress. The Dual V4 pump station package includes chamber, all internal pipe work and two powerful V4 pumps. The Dual V4 pump station is suitable to collect ground water from a 150m² basement that requires a head height over 3m. The Dual V4 is capable of pumping 12m² of surface area in addition to ground water.